Dr Dave Sloggett considers the implications of the recent counter-terrorism activity in London and asks are we on the brink of a wave of terrorism? The response to both incidents was fast and furious. Armed officers quickly arrested a lone individual carrying knives near to the House of Commons a matter of weeks after six people died in an attack on the mother of all Parliaments. Hours later, armed officers shot and injured a woman whilst arresting three other people in what the police have described as an ‘unrelated’ incident. Both incidents provide an insight into the problems faced by counter-terrorism police on a day-to-day basis. Perhaps the most difficult challenge is deciding whether or not to allow a plot to continue to develop despite good intelligence, such that it reaches a point where it culminates. In the wake of these attacks, Scotland Yard have - unusually - gone on record to say that there are “another two plots being closely watched”. They also say they have stepped up surveillance in order to monitor what they call “active” plots which are believed to be inspired by the so-called Islamic State or a resurgent Al Qaeda. While these efforts are clearly focused on London, the success that Special Branch have had, and the statement that they are tracking two more active plots, may persuade groups to think about alternative locations – softer targets outside London where the potential to kill more people is increased. The danger for society as a whole is that Special Branch officers might get this wrong, delaying an arrest and allowing an attack to occur or accidently creating the conditions where a group believes it has to act quickly before being arrested - as in the case of the attacks on Brussels Airport and the Metro on 22 March 2016 that led to the deaths of thirty-two people. For those involved in counter-terrorism it is a no-win situation. It is axiomatic that someone will be upset. Get it wrong and arrest an innocent person then left-wings liberals will be venomous in their response. Make a mistake and the Extreme Right Wing (ERW) will draw their own conclusions and act accordingly. If that were to occur society could quickly be on the brink of a major series of attacks and counter-attacks spiralling out of control. Imagine the public back-lash against the police if such a mistake were to be reported and an attack killing many tens of people had occurred. The state would be seen to have failed in its primary duty: to protect its people. Senior political leaders would find it hard to survive. Resignations would abound. Senior figures in the public services would also be expected to resign. A lack of money would not be seen to be an excuse for a lack of preparation. On social media, many would quickly turn to the kind of vituperative rhetoric that would have ‘political correctness’ in its cross-wires. This would inevitably gain traction in a society that has become increasingly divided along political and ethnic fault lines. Clearly, in respect of the arrest outside the House of Commons, the police are reported to have been monitoring the activities of the accused prior to his arrest. Similar reports suggest that those arrested in a raid mounted by armed officers a matter of hours later were also under observation. The speed with which that operation was launched, and its timing in the evening, suggest that Special Branch became aware of an imminent threat to the population in London. That could be explained by the earlier arrest acting as a trigger for the group to attack quickly, bringing forward their plans to try and capitalise on the coverage that was already appearing on television. Imagine a situation where this group of four people had been able to launch an attack. How would the media differentiate the two? Initial reporting would merge the two events. By default, they would be aligned. Even if, in practise, there was no linkage whatsoever. One of the inevitable consequences of such a deadly combination of attacks would be a reaction by the ERW. This would take many forms. Random attacks against individual Muslims have traditionally emerged as a pattern of behaviour. As with the aftermath of the attack on drummer Lee Rigby the pattern of attacks quickly builds up and reaches a peak in the few days immediately after the terrorist event. Then, over a period of time, things slowly calm down. One obvious danger is that a major attack could trigger a lasting and significant backlash. One that spirals out of control. Two or three attacks in quick succession could trigger such a reaction. It would quickly become very difficult to control, possibly even surpassing the scenes witnessed when rioting broke out in Tottenham and quickly spread from London across the country – severely straining the resources of the emergency services. In such a situation, we would be quite literally on the brink of a major assessment of society’s resilience. One that not only tests the emergency services but also political leaders. It is a wonder, therefore, why the Islamic State, which professes to drive at the fault lines in society, has not achieved more. Mercifully, people who are vulnerable to radicalisation largely appear to have ignored both Al Qaeda and IS’s attempts to mobilise them into making attacks. Despite extensive efforts to create the conditions in which many will apparently ‘self-radicalise’. But can that last? With over four hundred British people returning in the United Kingdom after having travelled out to Syria and Iraq to fight for IS the situation may be very different. Overseas these people will have formed bonds fighting alongside each other. Cleverly IS kept people who originated from specific countries together as ‘brigades’. Those bonds forged in the crucible of fighting to establish a Caliphate, a task that they clearly have failed to achieve, provide a network of contacts that will be very hard for Special Branch to penetrate. The result of this can only mean one thing. That underneath the surface of what is visible to Special Branch today is a network of potential terrorists that might unleash a wave of attacks in a short period of time. This is the nightmare that many in senior command positions in the emergency services privately fear. The degree to which we are on the brink of such an outbreak of attacks may only suddenly become clear. For those attending the Fire Congress in Birmingham on 18th May, this analysis will form the day’s backdrop. After the scene setting introduction delivered by Dr Dave Sloggett, leading speakers from the Fire and Rescue Service will speak on how they have prepared for such an eventuality. Lee Howell - the Chief from Devon and Somerset Fire and Rescue Service - will deliver a speech on their systematic improvement of resilience within the organisation and how that is already having benefits when routine fires occur. 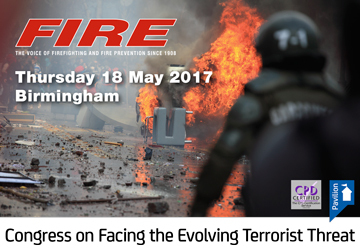 Mick Osborne from the Buckinghamshire FRS will also update the Fire Congress on their ‘get big quick’ approach that he introduced last year. For senior fire officers and their colleagues in the emergency services and those responsible for their welfare it promises to be an instructional event. One that will help them deal with any range of incidents should society cross the threshold of terrorism and generate a sustained backlash from the ERW. While that may be a bleak day its impact can be mitigated if people are prepared. That is the nature of personal resilience. It is the building block out of which organisational resilience and, consequently, society’s resilience is built.